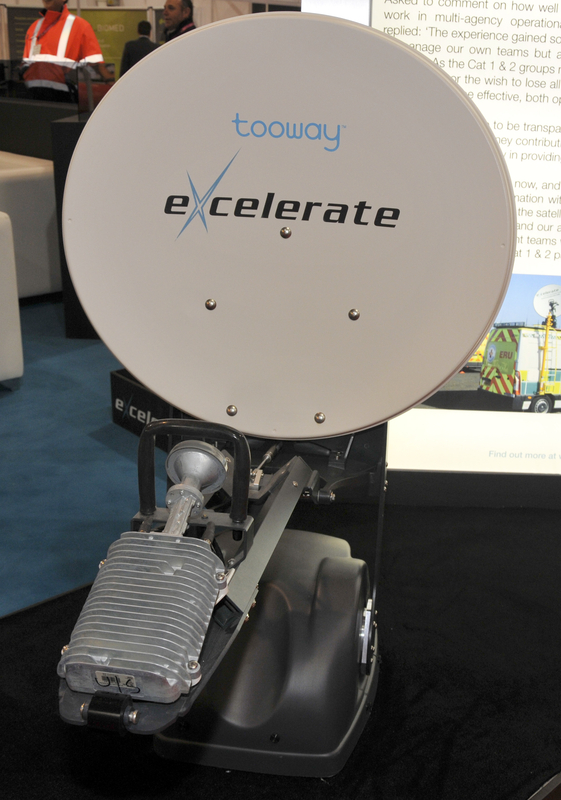 Leading mobile satellite broadband provider Excelerate Technology Group has announced that it is now offering Ka band satellite services in addition to its comprehensive Ku band services. David Savage, founder and CEO of Excelerate Technology Group, explained the thinking behind the decision: ‘Unusually for us, we were not the first supplier to provide Ka solutions for emergency services, and the reason we didn’t do that, the reason we waited, was because at the time none of the hardware platforms were actually accredited by the satellite networks. ‘What we can’t do, given that we have a brand and a reputation to consider, is to introduce and offer a Ka solution where there was any risk whatsoever, where the client might buy a product that could theoretically be turned off if there wasn’t accredited equipment. So we waited until various platforms started to get their accreditations. That has happened, so we are now in the Ka satellite market. Excelerate Technology Group’s Ka offering will complement its Ku-based Enhanced Resilience Satellite Network (ERSN), a development which provides all of its customers with access to two independent satellite networks instead of one, thereby guaranteeing automatic backup for mobile satellite broadband services used by emergency services. ‘We want to be able to offer things that nobody else can,’ said David Savage. ‘Regarding our Ku-based Enhanced Resilience Satellite Network, nobody else can provide that level of resilience without the client having to go through significant extra expense and delays getting reconnected should there be a terminal failure of a satellite. ‘With Ka we had to wait until the satellite antennae received their approvals and accreditations. We needed to choose our network carefully, because the only competing services being offered in the UK were effectively offering consumer products and consumer tariffs, network dynamics that were for the masses but those providers have no control over the quality of that broadband. Having gone through the pain barrier many years ago, we know it doesn’t work if you can't control quality, if you can’t provide a more professional grade of service. For emergency services customers and business customers we have had to do quite a lot of work in coming up with a range of solutions to overcome that problem. We are agnostic about both alternatives. We have no axe to grind concerning either of the two systems. ‘However, if a client insists on being supplied with a consumer type solution, purely based on cost, we will be as competitive as we need to be to secure that business, and we can do that because of our size and our market penetration - our market power if you like. We can provide Ka satellite antennas far more competitively than anyone else in the market place.